The best kind of portable appliances are ones that serve more than one purpose because they save space, time & hassle when loading up. This is why our electric cooler & warmer system control is a top seller among those who entertain on the go! 9 soda cans refreshingly chilled on hot days & then use the thermo setting to warm up food dishes before serving. removable strap for easy carrying, the NutriChef digital electric cooler for car & home really is a must-have for day-tripping families. in the office or in the lunch room. The dual warming & cooling personal fridge is as versatile as it is easy to use & convenient. Ready to hit the road with our thermo cooler by your side? Our warming electric coolers for vehicles are best for roadtrippers, traveling families, hunters + more. Make sure you're prepared for your next adventure. 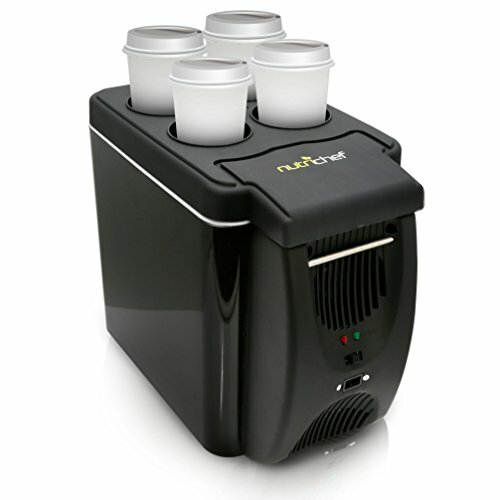 Order a NurtriChef 7L electric mini fridge today! REMOVABLE STRAP: Our thermo cooler warmers come with a removable strap, allowing you to carry it wherever you please. Put it on the deck/patio & then take it on road trips, beach, party.